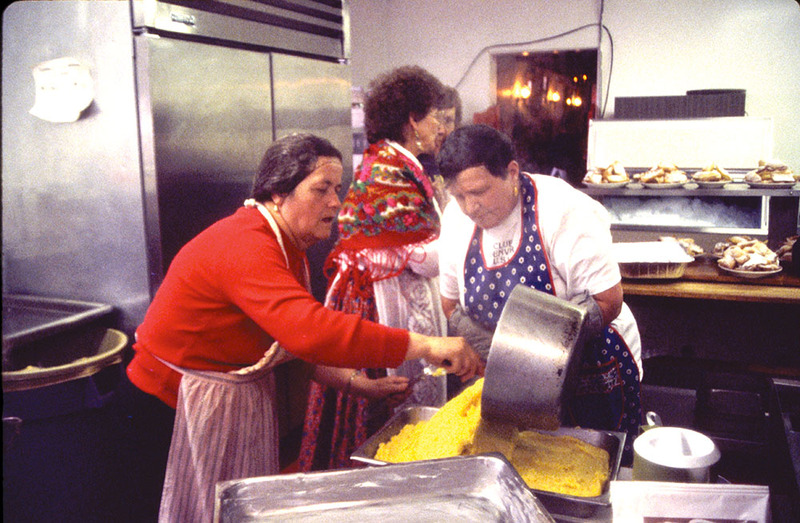 One cold spring day back in 1997, all the Trentini in the world came to Silverton and ate polenta. Enough of them, anyway, to fill up the Bent Elbow Restaurant and Old Time Saloon on notorious Blair Street. From as far away as New York City, Chicago, and San Francisco, dozens of these Italian descendants traveled to the heart of the San Juan Mountains where their foreparents from the Autonomous Province of Trento on the northern fringe of Italy had settled a century ago. A spring blizzard raged on that Sunday in May. The wind blew tiny icy needles up Blair Street’s lonely lengths. The empty, broad-shouldered wooden buildings leaned into the storm like they’d done for over a hundred years, waiting patiently for the dandelions to bloom and the tourists to return again. Up in the mountains, the snow drifted in and the highways turned slick. But inside the Bent Elbow, with its pressed tin ceilings and slanted floors, troops of Trentini were keeping plenty warm. They kissed in the kitchen. Compared notes on family history. Toasted the Old Country with homemade grappa. And danced ’til the floorboards creaked and moaned. It was kind of like the northern Italian version of St. Patrick’s Day. Everyone was invited to come and be Trentini for a day. On the sidewalk outside, Mario Cassagrande of New York City sheltered beneath the Bent Elbow’s yellow-painted balcony, preparing polenta in a shiny copper cauldron over a propane burner. First, he whisked cornmeal into boiling water. Then he stirred the mixture slowly, slowly, slowly, with the “Polenta J-Stroke” using a well-worn bastona polentar—a two-fisted wooden paddle about three feet long, used traditionally for both the preparation of polenta and the disciplining of naughty children by stern Italian mamas. Inside, the dining room was a-swirl with red and white—the colors of Trento. The women wore long, loose, floral peasant skirts topped with hand-painted aprons and shawls. The men sported jaunty felt capelli hats, and some even wore alpina-style knickers or pantaloni, knee-socks and suspenders. At the center of it all sat the benevolent Italian half-breed who had organized this gathering—Gerald Swanson—with his feisty redheaded sweetheart, Nancy, at his side. Together, they run the Villa Dallavalle Inn on notorious Blair Street, the self-same inn that his immigrant grandparents, Dominica and Giovani Dallavalle, built out of rock and mortar a century earlier. This is Silverton’s official Trentini headquarters and Gerald’s boyhood home. An Italian flag still hangs above the door, and the window sports a sign that says “Parking for Italians only; all others will be towed.” Inside, an assortment of photographs, antiques, and framed newspaper articles chronicle the history of the Dallavalle family who first came to Silverton in 1895. Their forsaken homeland was a rugged, dirt-poor, Italian-speaking corner of the Austro-Hungarian empire called Tyrol, hidden in the shadow of the pale limestone peaks of the Dolomites. Poverty-stricken young Tirolesi, as natives of the region were called up until 1919 when their territory was ceded to Italy and re-christened Trento, scattered like so many canederli in brodo (dumplings in broth) across the globe in the late 1900s and well into the 20th Century in search of a better life. Thousands found refuge in Colorado’s mining towns where they discovered a ready means of livelihood and a landscape achingly reminiscent of the alpine beauty they had left behind. After retiring from life in the treacherous mines, many stayed put, opened businesses, and stitched themselves into the diverse fabric of their new communities. Silverton’s Hillside Cemetery, with its 500 Trentini dead, remains a quiet testimony to their early presence in this town. There are an inordinate number of Italian names among the crooked old tombstones, memorializing the men, women, and children of Trento who lived and died here—many before their time. Generations later, Tirolesi/Trentini surnames still season the small mountain towns in which they settled, and those names peppered the Bent Elbow that night: Antonelli, Andrietta, Anesi, Bonatti, Condotti, Fedel, Fellin, Ficco, Mattivi, Montonati, Svaldi, Todeschi, Zanett. Gerald swirled the dregs of his glass of grappa and surveyed the reunion that was joyfully unfolding around him. Finally, at long last, it was time to eat. Cassagrande and a few friends lugged the steaming pot of creamy yellow polenta into the kitchen, where the women then took charge, pouring it into large pans, allowing it to cool and set, and then slicing it into wholesome, earnest squares and serving it up with lashings of rich meat gravy, grilled sausages, and sauerkraut. We settled at tables, our plates overflowing. The polenta smelled of cornfields and sunshine, and tasted even better—like warmth, and hearth, and belonging, and comfort, and family, and rich, good things to come. It tasted of home. Lilting snippets of conversation swirled around the room like delicious aromas. The band started up with another polka tune. Across the table, Lorenzo Groff pushed back, caught his wife, Jane, in his arms, and twirled her across the dance floor. Although he had immigrated to Silverton over 36 years before, Lorenzo still spoke with a Tyrolean accent thick as the meat gravy ladled over his polenta. The tables at the Bent Elbow are empty for now, and the polenta pot scrubbed clean, put away until next time—whenever that may be. Not many Trentini old-timers remain in Silverton these days. Most of them, such as Gerald and Nancy, have headed to places where the air is not quite so thin, the winters not quite so snowy. And their children have scattered, like those of a century ago, to new places with more vibrant opportunities. But the Swansons still return to Silverton each summer to run the Villa Dallavalle. Gerald regales his guests with stories … and the occasional glass of grappa. The Trentini, after all, have a knack for sticking it out. Perhaps the secret to their success is the polenta—that simple, unpretentious stick-to-your-ribs porridge of boiled cornmeal, the eating of which has both fortified the Trentini diaspora and provided them with an age-old excuse to gather. In a large pot bring the chicken stock, cream and nutmeg to a sim- mer. Using a whisk, slowly add the corn meal and semolina. Bring back to simmer….very low simmer while stirring. Whisk in half of the parmesan and use the remaining parmesan as garnish. Taste for salt and pepper and adjust. Plating: put a slice of warm squash on the plate, pour the polenta on the plate next to the squash, garnish with truffle oil, diced squash, parmesan and Italian parsley.